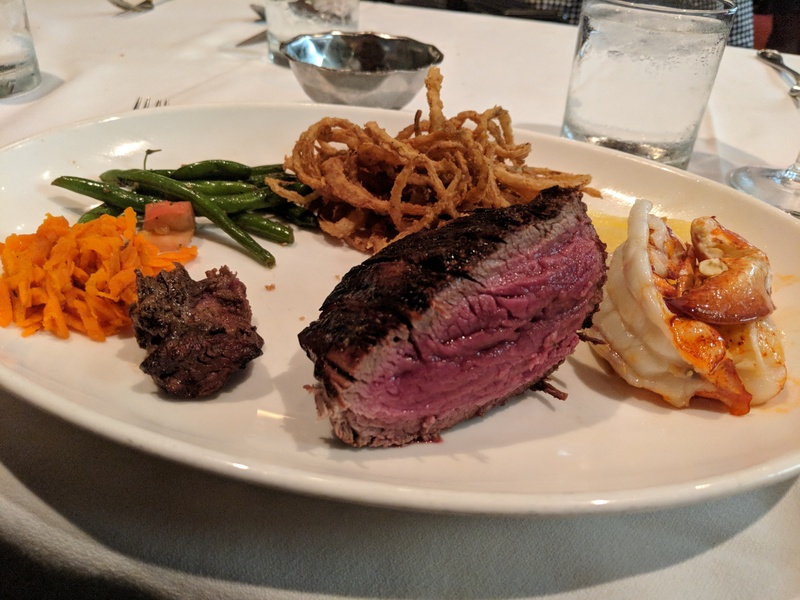 The one thing I wanted for my birthday this year was for the husband’s family to make the trek out from Orlando to go out to dinner at Bern’s Steakhouse with us. I wanted to spend time with people and have a fantastic meal. Note: Most pics are enlarge-able by clicking them. There is a dress code there, but not too severe so we put on our business causal best and headed out! When you arrive at Bern’s it’s always a little disorienting because it’s so dark inside the lobby. We always make the joke that it’s like the Haunted Mansion at Disneyworld. Once everyone in our party was there (at 5pm sharp!) we were seated and prepared to make our selections. We also ordered drinks. Cosmopolitan for meeeee. 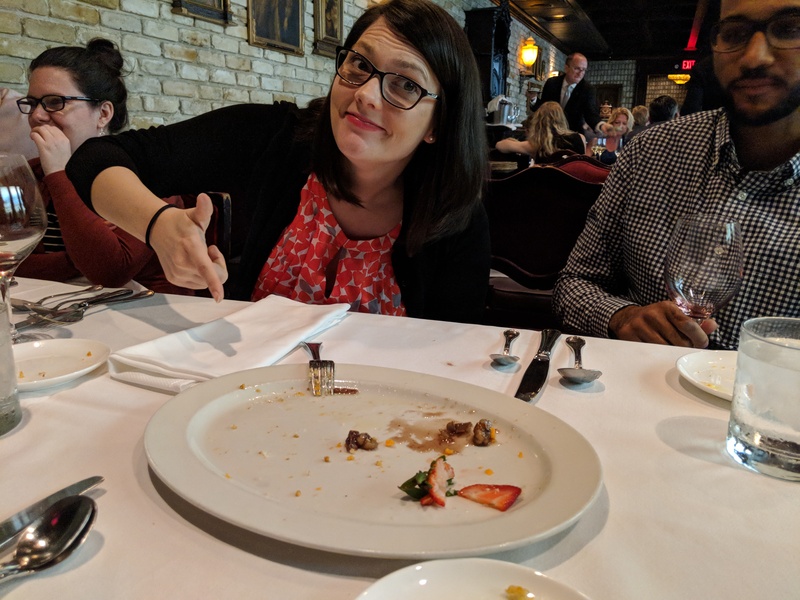 We decided to get a cheese plate, which came with olives, mushrooms, and toasted bread, but I forgot to take a picture of it and then it was gone (sorry Paige :-(). Also it turns out the Cheese Cave is not a place you can actually go. Really the cheese brought disappointment but it was very tasty. Left to right: Sisters in law Sarah, Stephanie, and Stephanie’s husband Ariel. Every entree at Bern’s comes with soup, salad, baked potato, fried onions, and vegetables. First comes the French Onion Soup covered in a trio of cheeses. It was accompanied by small garlic bread and regular bread, lightly toasted. Then came the salad, which I forgot to take a picture of but who even cares because it’s salad. Everyone got something that they absolutely enjoyed. The baked potatoes came with sour cream, whipped butter, bacon, and chives, and the waiter made them for us at our table. After dinner we went on a tour of the kitchens and the wine cellar. The wine cellar holds enough bottles of wine to have a different label every night for 22 years and never drink the same wine twice. There is also a bottle that goes for $30,000 (a merlot I think?) but really it’s an impressive collection and considered the largest collection in the world. 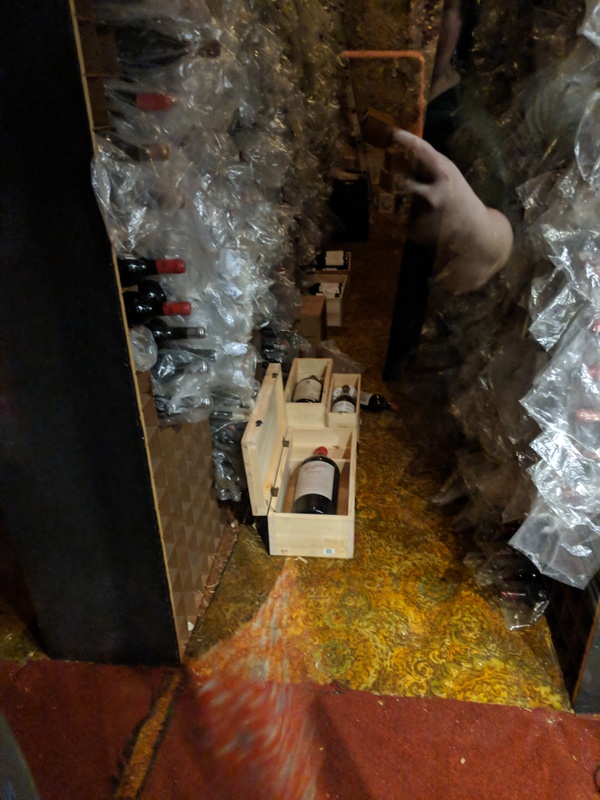 The bottle in the box on the floor in the upper left is the $30,000 bottle of wine. This is the part of the cellar where the most expensive bottles are kept so they are behind glass. 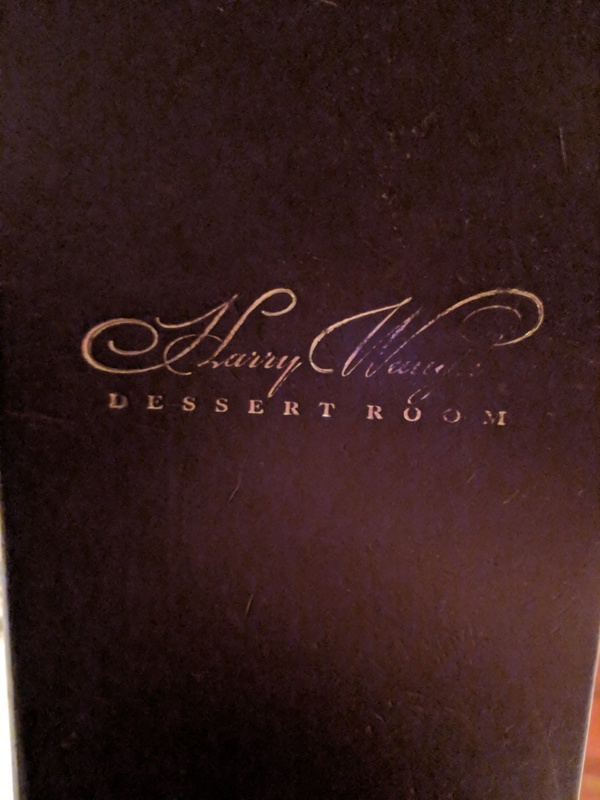 After taking a walk through the cool wine cellar, we were escorted to the stairs which led to the upstairs Harry Waugh Dessert Room. The dessert room is made up of several private booths, completely walled in with a small door on each side. You can pipe in any kind of music you’d like, including the live piano music happening at the center of the room. 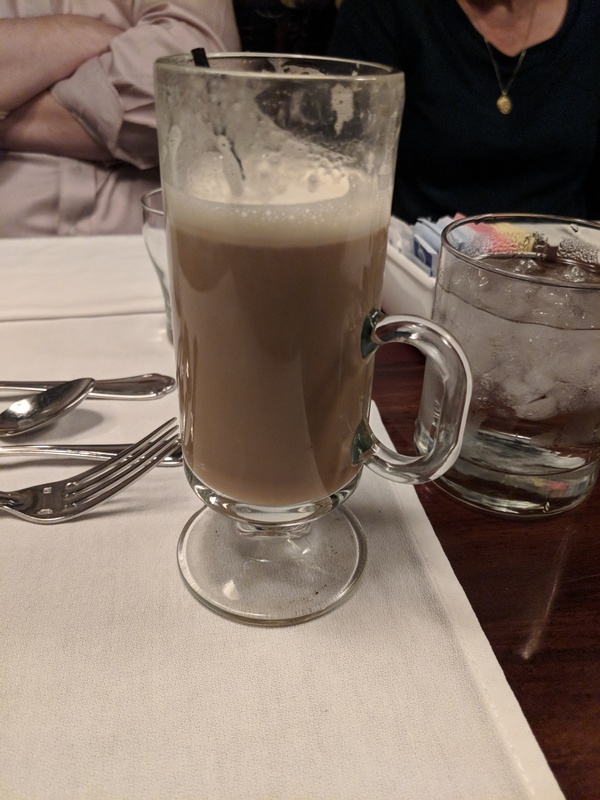 We all ordered some “drinks with spirit” – I had a mint chocolate coffee with mint liqueurs. Then we ordered our desserts. I did end up getting the Framboise Chocolate Decadence: Chocolate, macadamia nuts, raspberry, and whipped cream. The rest of the family got an assortment of desserts, including a HUGE hot fudge sundae for Sarah, and a banana split for my father in law Jim. He got to choose 3 different flavors of ice cream to include on his split! There are many flavors to choose from. 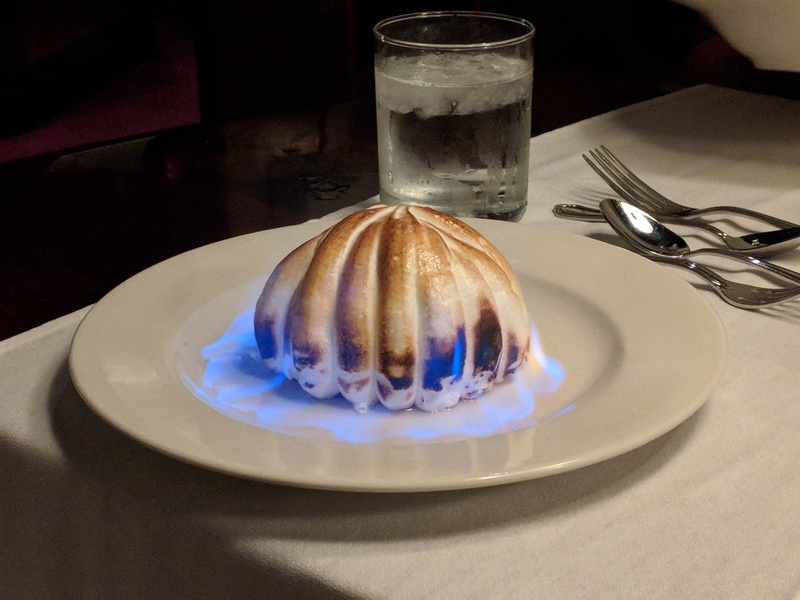 The husband got a Baked Alaska, which arrived at the table on fire. Check out the Facebook group for a video! Overall it was a really enjoyable evening. Jim cleared every plate in front of him, and made the joke that everything was so terrible that he had to eat it all so other people wouldn’t be subjected to it. There were lots of smiles all around, and I think that they were glad they made the trip. 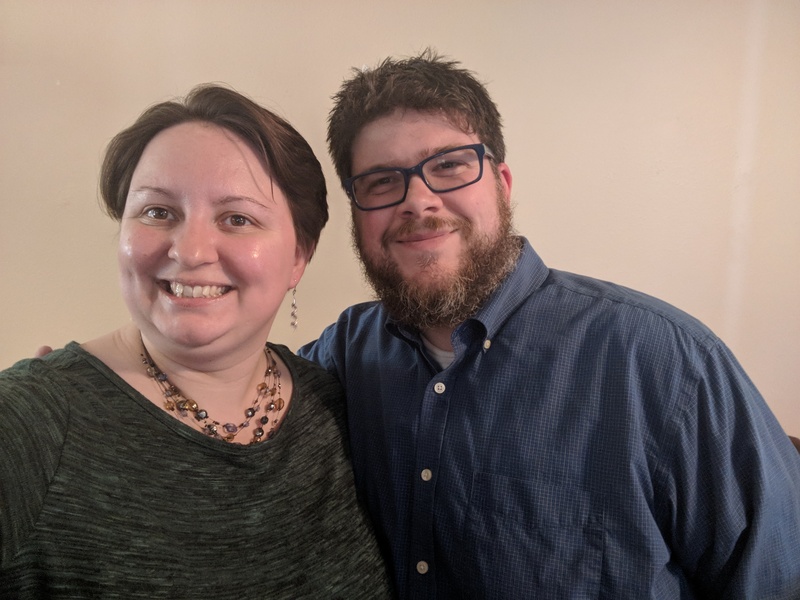 Special thanks to Maggie S, whose $50 gift card helped to provide my side of lobster and coffee with spirit at dessert!